The first major retrospective in more than 20 years devoted to the great 16th-century painter Domenikos Theotokopoulos (1541-1614) – known to posterity as El Greco – opened at The Metropolitan Museum of Art on October 7, 2003. One of the most original artists of his age, El Greco was celebrated for his highly expressive and visionary religious paintings. The international loan exhibition's approximately 80 works included an unsurpassed selection of his psychologically compelling portraits, as well as his rare incursions into landscape, genre, mythology, and sculpture. Particular emphasis was placed on his late works, in which mystical content, expressive distortions, and monumental scale are taken to ever greater extremes, culminating in the Adoration of Shepherds, the spectacular nine-foot-tall painting created to decorate his own tomb. All aspects of the artist's activity were explored, from his beginnings as an icon painter in his native Crete, to his move to Venice and Rome and his study of Italian art, to his definitive move to Toledo, Spain, and his creation of a uniquely personal and deeply spiritual style. His work has sometimes been associated with the great mystics of Counter-Reformation Spain, but his paintings have had a profound influence on the protagonists of 20th-century modernism, including Pablo Picasso and Jackson Pollock. 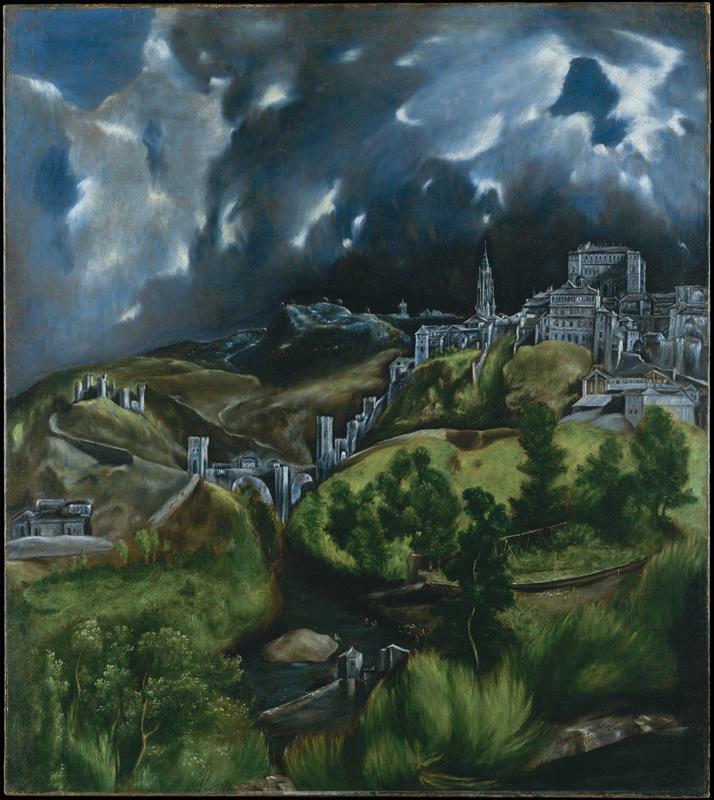 El Greco remained on view at the Metropolitan through January 11, 2004. The exhibition was organized by The Metropolitan Museum of Art, New York, and The National Gallery, London. "In his own time," stated Philippe de Montebello, Director of the Metropolitan Museum, "El Greco's highly personal style – with its dematerialization of the figure and its expressive effects of light and color – was without precedent and often astonished his contemporaries. Yet it is only in the last 150 years that he has come to be appreciated as one of the great creative geniuses of Western art. This landmark gathering of his works, which has been organized by an international team of scholars, builds on the last major El Greco exhibition of 1982 with a greater focus on the artist's late and most mystical phase, and the philosophical and religious thought that informed it." 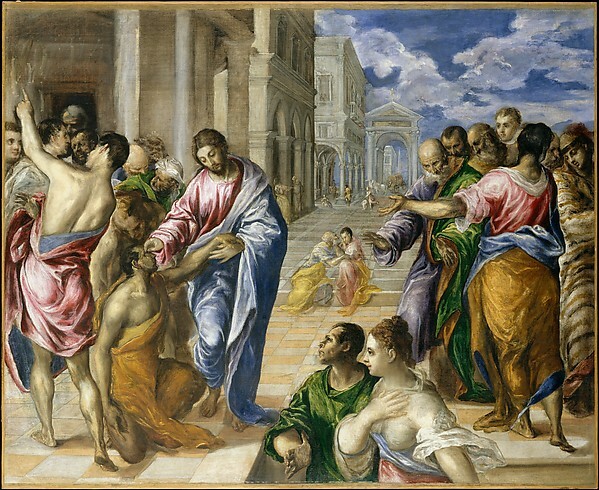 A unique synthesis of late medieval Byzantine traditions and the art of the Italian Renaissance, El Greco's art sought to create a new and spiritually more intense relationship between viewer and image. Although he established a large and productive workshop in Toledo, he founded no school, and for almost two centuries following his death his works were decried for their extravagance—except for his astonishing portraits, which Velazquez took as his model. A sympathetic interest in his art was the product of the 19th-century Romantic movement's new emphasis on individual expression and extremes of emotion. 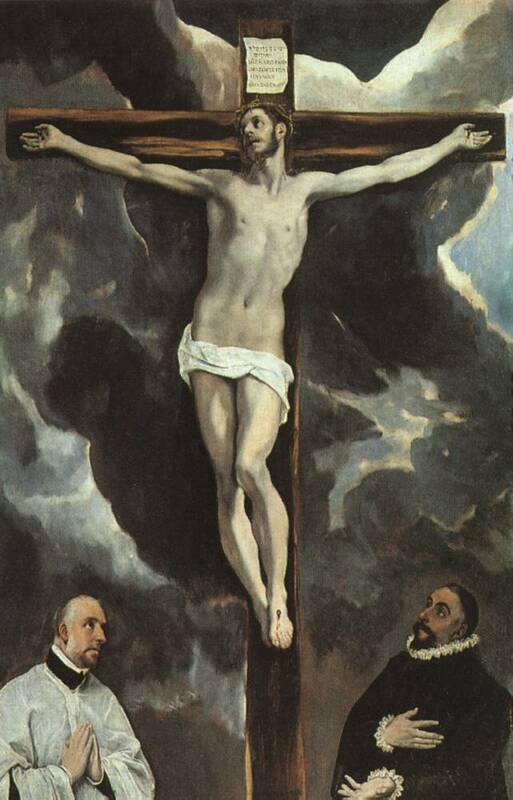 Since then El Greco's creative stature has never been challenged. Vincent van Gogh and Paul Gauguin saw themselves as his artistic heirs. More recently, his works have inspired the expressive abstractions of generations of 20th-century painters. The 1982 exhibition of his works was seen in Madrid, Washington, Toledo, Ohio, and Dallas. were among the rare, early works documenting El Greco's first training as a painter of religious icons in his birthplace of Crete. The archaizing abstractions of these images – based on late medieval prototypes – reflect his country's continuing reverence for the Byzantine traditions of its Greek heritage. The style and sacred function of Byzantine icons, which rejected mimesis in favor of an attempt to mystically embody the living presence of the divine, greatly shaped El Greco's approach to religious art. Throughout his career, he always signed his works with his Greek name, Domenikos Theotokopoulos. A number of key works illustrated the transforming effects of El Greco's stay in Italy, beginning with his arrival in Venice, in 1567, and his subsequent stay in Rome, from 1570 until 1577.
with its deep, stage-like space, bold brushwork, and dramatic lighting, shows the powerful influence of Titian as well as the Venetian mannerist Tintoretto. 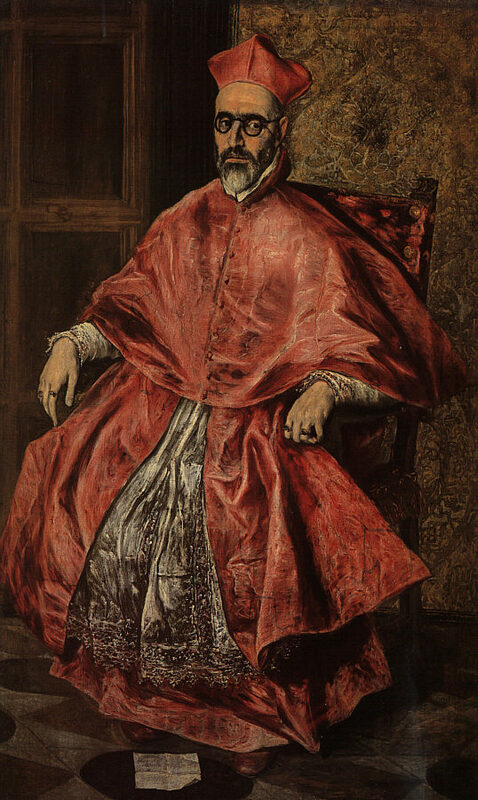 During the Counter Reformation the theme, reprised several times by El Greco, was interpreted as the purification of the Church. Works from the artist's sojourn in Rome display El Greco's study of the art of Michelangelo and his awareness of Italian art theory. He became a member of a small circle of antiquarians. is a rare and charming example of El Greco's excursion into genre painting as well as an emulation of a celebrated lost work of ancient art. In 1577 El Greco traveled to Spain, where he hoped to find royal patronage – unsuccessfully, as it turned out. Instead, he settled permanently in Toledo, still an intellectual and religious center of the country. Once again, he found his place among a circle of scholars and church reformers who appreciated his signature style, with its elongated, undulating forms and sometimes dissonant colors. was among the first works painted by El Greco in Spain – perhaps an attempt to attract the attention of Philip II, who is shown kneeling in the foreground. The artist painted two versions of this religious allegory, which were shown together for the first time. Although the larger of the two versions found a place in Philip II's grandiose palace, the Escorial, El Greco did not become one of the king's artists. and The Resurrection (Museo del Prado, Madrid). In the Resurrection (ca. 1597-1604, Museo del Prado), one of El Greco's most celebrated works, expressive distortion and mystical drama are taken to unprecedented extremes. Emerging from the tomb with an almost explosive force, Christ acts as a magnet, pulling the figures below, drawn out to impossible lengths, heavenward. designed to hang above the artist's tomb. Here, the body of the infant Christ, tiny on the ten-foot-tall canvas, emits an incandescent glow that illuminates the entire composition. Heavenly as well as earthly worshippers appear to be weightless, slowly spiraling in adoration around his form. 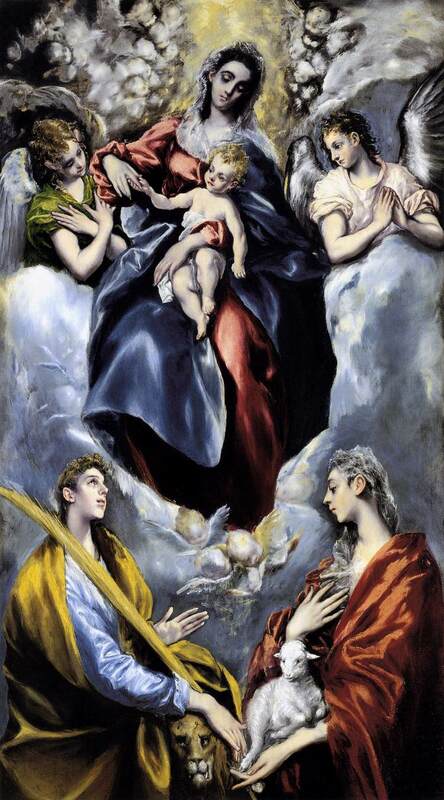 The painting is an unrivaled example of El Greco's visual expression of ecstatic union with the divine. whose piercing gaze suggest the stern rectitude with which he carried out his duties. Fray Hortensio Felix Paravicino (1609, Museum of Fine Arts, Boston). A noted poet and professor of rhetoric, he was one of El Greco's admirers in Toledo and dedicated four poems to the artist. sometimes considered the first expressionist landscape in Western art. a late work in which El Greco openly vied with the celebrated first-century sculpture in the Vatican signed by Hagesandros, Polydoros and Athenodoros of Rhodes. The subject, taken from Virgil's Aeneid, concerns the gods' punishment of the Trojan priest Laocoön in front of the walls of Troy, which El Greco shows as Toledo. The writhing forms and expressions of despair and physical pain make it one of his most powerful works. Following its showing at the Metropolitan, El Greco was on view at The National Gallery, London, from February 11 through May 23, 2004. The guest curator of the exhibition was Professor David Davies, a noted El Greco scholar. He has been assisted by Gabriele Finaldi, formerly of The National Gallery, London, and then associate director of the Museo del Prado, Madrid; Xavier Bray, assistant curator at The National Gallery, London; and Keith Christiansen, Jayne Wrightsman Curator in the Department of European Paintings at the Metropolitan Museum. El Greco was accompanied by a fully illustrated catalogue, authored by a team of international scholars, including: Professor Davies; Sir John Elliott, Regius Professor Emeritus of Modern History at the University of Oxford; Gabriele Finaldi; Keith Christiansen; and Xavier Bray. The catalogue was published by The National Gallery, London, and distributed by Yale University Press.